Plant Nappy® by Manvers Engineering Ltd.
Manvers Engineering Ltd adopted the task of development, and eventually bringing a product to the market. Manvers Engineering Ltd holds the registration of both the Plant Nappy® name and the Plant Nappy® logo and has recently had grant of patent on the Plant Nappy® products. The Plant Nappy® is designed to replace existing forms of drip trays with a new light, user friendly method of containing the odd mishap. The mat is rugged enough to stand plant on it in all weather. 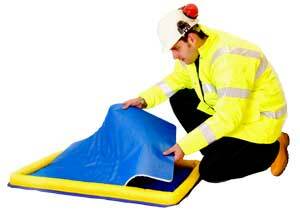 Whilst encapsulating any drips or spills of oil the mat freely allows passage of water, such as rainfall, thus eliminating costly emptying of contaminated trays after use.The mat can be stood on uneven ground or slight inclines with no loss of performance ensuring your company is protected at all times. With the ever growing popularity of the product, many well established companies are using the Plant Nappy® products systematically on site and deeming it their best practise for spill containment.